Discussion in 'RPG Archives' started by batnkevlar, Mar 8, 2005. This is the Season II of the DC Universe RPG , similar to zer00's GTA: Hype City thread and my other Season of "World of Heroes: DC Style" RPG, and my "Heroes vs. Villains: Marvel" RPG in the Marvel Comics Board. This is instead the planet Earth of the DC Universe. The game is closed. It will start again and the first person to screw it up will be booted. YOU CAN NOW START PLAYING!!! "In Brightest Day,in Blackest Night, no Evil shall escape my sight. Let all who worship Evil's might, beware my power: Green Lantern's Light!" "Come on boys. Let's get to work..."
OOC: No fair, you're the guy who started the bloody thread. Parasite looks over the smoking ruins of the Daily Planet and chuckles to himself. Rudy then transforms into one of the reporters he had drained from before destroying the Planet. He simply walks away from the wreckage without anybody giving him a second glance. Zoom proceeds to monologue in a very dragoonesque style, starting off with, "I have returned." Quickly followed by, "For showing me tragedy for the past ___ Years, I will in turn repay the debt two fold." 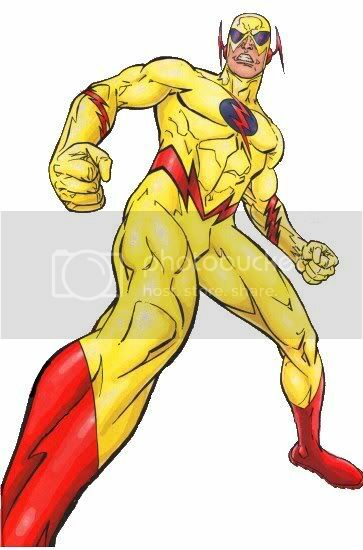 Flash slowly stands up in a daze and hears the faint shadow of a very familiar voice which HE CAN'T NAME (so you don't immediately point fingers to me ) "I'm Back~"
"How'd I get meself into this?" Officer O'Brien was trapped under a girder. Her legs were pinned and she was losing blood fast. The giant robot had brought an entire building down on top of her but still she clung to life. "If I can just lift---" Suddenly the crushing weight on O'Brien's legs lightened and she saw something that she would never forget. "Don't worry, officer. I'll have you out of here in no time." 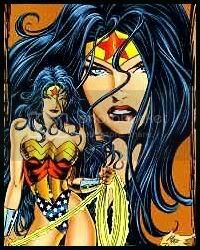 Wonder Woman dragged the officer out of the rubble and placed her gently away from the building. "An ambulance is on the way. I've got to leave you for now and stop this mechanical nightmare." Wonder Woman raced to where she saw the robotic menace about to demolish a Starbucks. "Hold villain! You'll not eva--- OOF!" Before she could finish her sentence the robot sentry attacked Diana with the strength of fifty men. "I've got to wrap this up before innocent civilians get hurt." 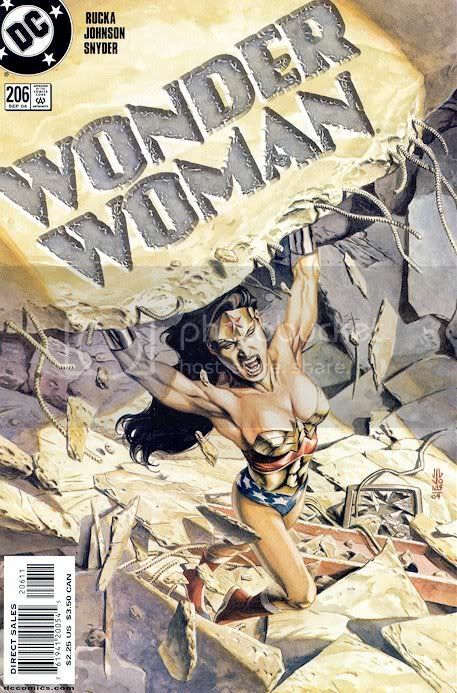 Wonder Woman summoned her great strength and ripped the arms off the mechanical menace. "You won't be needing THESE!" 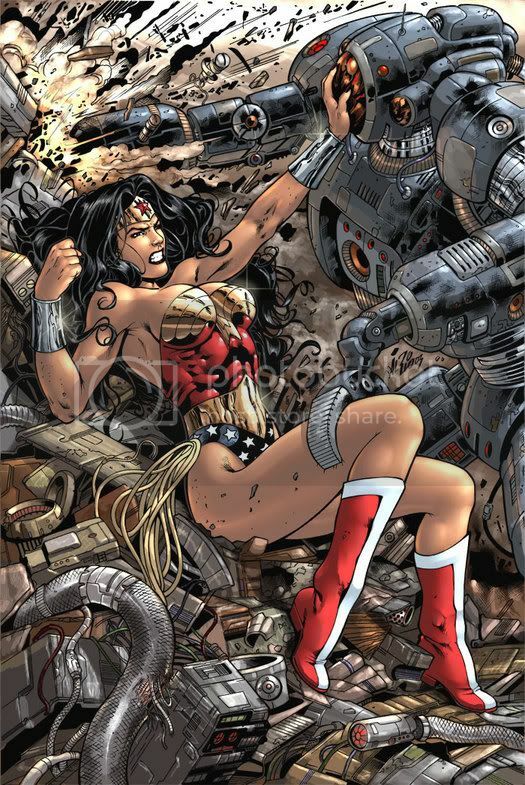 The robot beeped in anguish as Wonder Woman quickly and efficiently dismantled it. "Twelve minutes until arrival to Metropolis." I hear the computer opperating on auto-piolt but I'm not paying attention to it. Instead, I'm thinking of what just happened with Hal Jordon using Felix Faust to "mind-wipe" Lex Luthor--completely changing his personality, making him into a "productive" member of society. "One minute to arrival in Metropolis." I have to stop my musing/angsting, else I risk having the Batplane hit one of Metropolis' skyscrapers. I take the plane into manual direction and land on the Lexcorp Towers. Rudy Jones walks into a dark alley so that nobody will be watching him. He activates his smart vortal and transports himself to the Injustice Society Base of operations. Once he arrives, he walks to The Flash's cell to have another...taste of him. Once Rudy gets there, he has to take a second look just to make sure that his eyes weren't decieving him. The Flash was gone. A large hole had been vibrated through the wall, leaving the cell's interior exposed to the ocean floor. The cell was filled with water, but it didn't flow past the force field that separated the cell from the rest of the complex. Rudy runs to the monitoring station and sees the news about the Flash's incident concerning his pants. Parasite lets the image of Flash sink in for a moment. "These shots coming in to us live from Metropolis, where the Parasite has just demolished the Daily Planet building. A long familiar sight on the Metropolis skyline. It is unclear at this time....."
Digger smiles to himself and looks down to his schematics. "That's one righteous bloke with a SERIOUS mad-on" he chuckles. "This just in, at a celebration of the Flash's heroism, where he was to plant his footprints in cement, the Flash apparently hadn't fastened his trousers appropriatley causing them to fall down in full public view...."
At this Digger spits his beer all over the schematics he was reviewing and lets loose with uproarious laughter. Realizing his cover is somewhat blown, he opens his trenchcoat, revealing his costume, and dons his hat. "Looks like this bank job can wait...theirs fun to be had!!!" He leaves with an outstanding bill in the amount of $19.22. "I hope the decision of surrendering I made is worth it." On the radio trasmeter inside my cowl, I hear a news broadcast. "For those who just turned in, the Daily Planet has been destroyed by the criminal Parasite. The imfamous rogue has dissapeared as of this moment and we advice all citizens of Metropolis to stay indoors--"
"Superman," I call to him, "you should hear this." Digger Harkness strolls along the docks to an empty slip and touches a sensor on his belt. Rising up from the seaside depths is a boomerang shaped vessel. "Whot's it to be, eh?...a quick pillaging in Metropolis while the coppers are handlin' Parasite's pile of ashes and rubble? Or off to Keystone to add a little more to Flasher's embarrassment? Flasher....very appropriate name for the boyo now, I s'pose...heh"
After the fiasco with Flash's pants, Zoom decides to travel the world (backwards and forward in time) to get a better understanding of current events. "I see, the Injustice Society..."
Do I smell a Rogue's Gallery in the making? heh. "Everybody report to the HQ"
A laugh came from the darkness from behind Parasite. Turning to face this new arrival, Parasite sees a thin man in a green suit with bushy red hair and a moustache step from the shadows, a devilish grin on his face. Flying home from a mission in space Superman sees what is left of the Planet. "Great Scott, what happened here? LOIS!" At light speed he flies to the site searching for Lois. Using his X-Ray vision he is able to find Lois barely alive he takes her is his arms and races of to the nearest hospital. OOC: Dude, Lois was murdered last season. And I don't think Superman can fly at light speed. "Who the hell are you!? How'd you get in here?" Parasite cracks his neck and knuckles. "Meh, doesn't matter I suppose. A warm meal is a warm meal." Rudy starts walking towards the man. Having decided a course of action that would provide the most amusement, and most importantly, OPPORTUNITY, Harkness aims his 'Rang jet to the IS current/former HQ. Upon a stealthy arrival he hears voices ahead. "Easy there me boyo's...yeh start playin' rough and someone's gonna get their feelings hurt" he says...addressing Parasite and Riddler. "Seems to me to be a time of opportunity while the goodies are so busy cleaning up messes...so who wants to be good little soldiers of fortune and who wants to rip each other apart? Either game sounds fun to me, but I'd be more motivated by a few beers and some discussion about how we can turn a profit from the chaos Parasite has so generously afforded us." "And by the way gents...these accomodations aren't exactly a well kept secret any longer...took me 5 minutes surfing the web to get the intel...what say we take this gathering elsewhere, eh?" OOC: uh, so is AllStarSuperman, or Batman409 playing our Clark here? "Wait,"said the man, "no need to get all hasty. It is I, the Questional Master of Quizzes, the Paragon of Puzzement, Edward Nigma, the Riddler. You may not have recognized me due to my newly acquired appearance, but I assure you that despite my outward metamorphosis, I am still the Quizzical Queer I always was. Wait, that came out wrong." Parasite rolled his eyes at the corny introduction, but at least he paused for a moment. "Nevermind, I have a proposition for you." OOC: Hmmm.... Didn't see your post, should I edit mine to accomodate yours, or do you think it fits still?